Bed made, blank walls, drawers empty, musty and hot. Did you live here at all? October came—no word from you. The word "escape" flashes into my mind. Where the hell have you gone, Jeremy? and making meaning is the peeling of them. Then from the English lounge he strolls out the door to class. Grew a white flower for a nail. In September the flower went to seed and I dug up my harvest, after months of care and interest, to see what the soil concealed. I dug with my fingers, feeling the round hardness at the base of the woody stem. I pulled gently, working the soil, hearing fragile roots snap and feeling the stem groan. Into my hand emerged an onion. I've got to tell Hood that reading a poem is nothing like peeling an onion. layer after layer, peel what you will, it's just more onion. 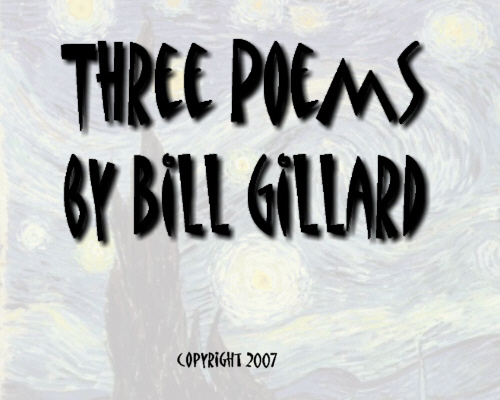 Copyright 2007, Bill Gillard. © This work is protected under the U.S. copyright laws. It may not be reproduced, reprinted, reused, or altered without the expressed written permission of the author. Bill Gillard is a refugee from the high cost of living in his ancestral homeland of New Jersey. He now lives with his wife and daughters in Appleton and teaches Shakespeare and creative writing at the University of Wisconsin-Fox Valley. He holds an MFA in fiction from Fairleigh Dickinson University in Madison, New Jersey. His work has appeared in over twenty publications, including Writer’s Chronicle, Alimentum, The Leading Edge, Paradigm, Poetry Bay, Star Line, Slow Trains, Spitball, Aphelion, Dark Sky, Surprising Stories, The Wisconsin Poet's Calendar, Explicator, The Dictionary of Literary Biography, and The Encyclopedia of Native American Literature among others.